On 22 February 2019, the director of the Luxembourg direct tax authorities released a circular (Circulaire L.G. - n°19, hereafter the "Circular") on criteria contained in the new provisions of §16, alinea 5 of the Adaptation Law of 16 October 1934 (Steueranpassungsgesetz, hereafter "StAnpG") allowing one to determine the existence of a permanent establishment in a State with which Luxembourg has concluded a double tax treaty ("DTT"). §16 alinea 5 of the StAnpG has been introduced by the Law of 21 December 2018, which mainly implements the Anti-Tax Avoidance Directive (please read our Tax Alert of 18 December 2018 on this topic). The purpose of the Circular is to clarify divergent interpretations that may arise when determining the existence of a permanent establishment ("PE"), either under domestic law or under double tax treaties. As a preamble, the Circular recalls that checking the existence of a PE requires meeting the criteria set forth in §16, alinea 1 of the StAnpG, according to which "a permanent establishment within the meaning of the tax law is every fixed piece of equipment or place, which serves for the operation of an established business." 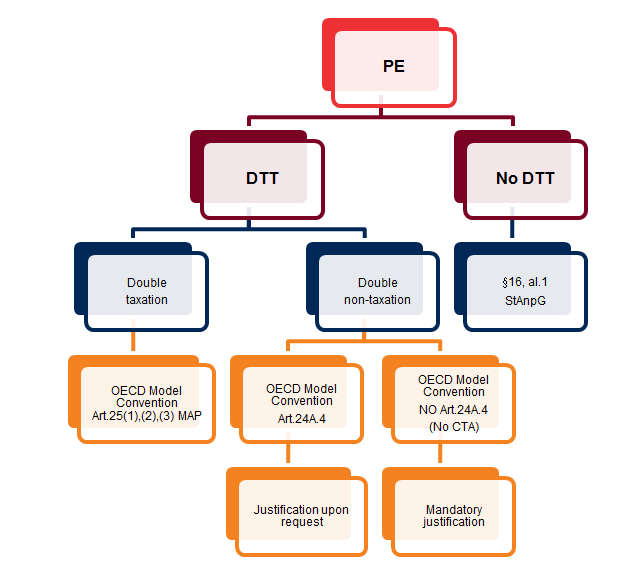 In case such analysis is related to a PE located in a State with which Luxembourg has concluded a DTT, the verification should be grounded on the criteria set by the relevant DTT. However, different approaches may be taken by the parties to the DTT, leading to situations of either double taxation or double non-taxation. The Circular explains that in the case of double taxation, the mutual agreement procedure ("MAP") as enshrined in the OECD Model Tax Convention should allow one to solve interpretation issues. Regarding double non-taxation situations, the Circular refers to article 23A.4. of the OECD Model Tax Convention, which provides that the exemption method set forth in article 23A.1 "should not apply to income derived or capital owned by a resident of a Contracting State where the other Contracting State applies the provisions of the Convention to exempt such income or capital from tax." Such provisions have been introduced in more than 40 DTTs that Luxembourg has concluded. Similar wording should be included in most DTTs concluded by Luxembourg upon the entry into force of the Multilateral Instrument to Implement Tax Treaty Related Measures to Prevent Base Erosion Profit Shifting ("MLI"), since Luxembourg clearly opted for the application of such provisions when signing the MLI back in June 2017. Since the MLI was adopted on 25 February 2019 and should be published in the Memorial in the coming days, the entry into force should be expected on either 1 June or 1 July 2019. Based on §16; alinea 5, in the case of an enforceable DTT between two States, a taxpayer from one State may rely on the existence of a PE in the other State only based on the criteria set forth in the enforceable DTT but should also evidence that the activities carried out in the other State constitute on its own an independent activity and represent a participation to the general economic life. This documentation requirement is mandatory for the DTTs that do not include provisions of article 23A.4 of the OECD Model Tax Convention while it remains upon request for the ones that do include such provisions. If the taxpayer fails to provide the documentation, the tax authorities will consider that the taxpayer does not have a foreign PE. The confirmation could take any form to the extent sufficient to substantiate the declarations or representations of a taxpayer. Among other things, it could take the form of either a tax assessment issued by a competent tax office or a certificate issued by the competent authority. The Circular has been warmly received, since it provides further guidance on the unclear provisions implemented by the Law of 21 December 2018 implementing the Anti-Tax Avoidance Directive. Taxpayers with foreign operations need to prepare for mandatory or upon-request documentation requirements to substantiate the existence of their PE. Our tax experts at Baker McKenzie Luxembourg would be happy to assist you should you require any further information in this respect.